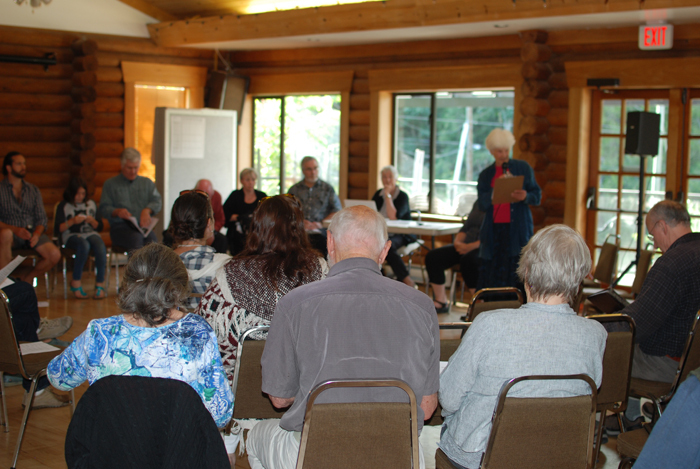 Salt Spring Community Alliance meeting on governance at Lions Hall on June 25. The Governance Working Group of the Salt Spring Community Alliance has suggested two possible ways to improve local governance, following an extensive examination of a wide range of options. “There was nothing that was off the table,” said GWG member Brian Webster in introducing the group’s process at a June 25 meeting attended by about 50 people at Lions Hall. The meeting summarized results of an estimated 800 person-hours of volunteer work put in by 17 people and took questions from the crowd. It outlined two possible ways to improve coordination and priority setting between various bodies, which Webster said was identified as a major problem with Salt Spring’s governance system during last summer’s incorporation referendum discussions. Dubbed a “local government working group” option, it would establish regular meetings of representatives from the Ministry of Transportation and Infrastructure, RCMP, fire district, North Salt Spring Waterworks District, Islands Trust and Capital Regional District. GWG group member Linda Adams, who is the former CAO of the Islands Trust, said it is envisioned as “something quite formal in that the groups would commit to going to it,” the meetings would occur on a regular schedule and minutes could be kept. No decisions could be made at such meetings because doing so would fetter the discretion of various bodies involved, she said, but a town hall portion could be included, as well as time for guests to address specific topics. “If we choose to do this [the different agencies] would enter into some sort of memorandum of understanding with each other,” said Adams. The other possibility is to pursue creation of a Local Community Commission through the Capital Regional District. As presented by economist Richard Kerr, that option would see four to six paid commission members elected island wide, in addition to the electoral area director who is currently the island’s lone elected CRD official. “In addition to bringing together decision making on all the matters the regional district deals with on the island, and which could become more than we have now, it would allow priority setting across different areas much more effectively than the current system,” said Webster. The LCC structure is well suited to taking on additional responsibilities, such as the NSSWD or fire district, which are both currently improvement districts, he added. Creating an LCC would require the consent of the CRD and Salt Spring voter approval through a referendum. Adams explained that other potential options were investigated by the Governance Working Group but did not pass three major elimination criteria. They could not require changes to provincial government legislation, which is a long and complex process that needs complete buy-in from the province; they had to protect the role of the Islands Trust and keep service delivery separate from land use; and they had to be acceptable to the provincial government policy-wise. Other ideas deemed not worth pursuing included other forms of incorporation, having Salt Spring put into a different regional district, creating an Islands Trust regional district or a multi-service improvement district, or developing a multi-service non-profit society to provide services as is the case on Hornby Island. The governance group aims to publish a report by the end of August. The Community Alliance grew out of the incorporation referendum debate, with the aim of working to resolve issues of governance and community concerns. SSCA working groups are also meeting on the topics of environment, micro-economics, housing/health, infrastructure and community visioning. The environment group is scheduled to give a report at the next SSCA meeting at Lions Hall on July 23 at 7 p.m.
For more information, visit www.saltspringcommunityalliance.org or email Gayle Baker at ssispeaks@gmail.com.